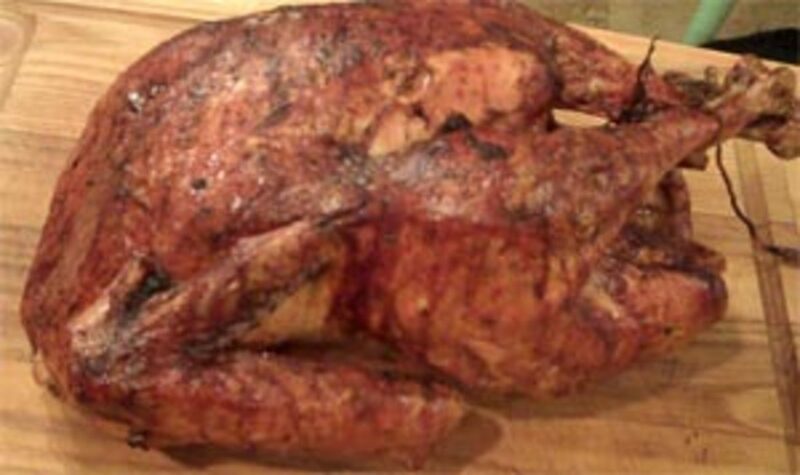 Watch OATV Video on how to make this Turkey! With machine running, drop garlic down feed tube of processor and chop. Add all remaining ingredients. Pulse, blending to coarse paste. Two or three days ahead season bird inside and out with salt and pepper. When ready to cook pull turkey out one hour before putting it in the oven to bring to room temperature (it will cook more evenly). Spread over cavity 2 tablespoons fresh herb butter. Starting at neck end, use a paring knife, to loosen skin between skin and meat of breast, thighs and upper drumsticks. 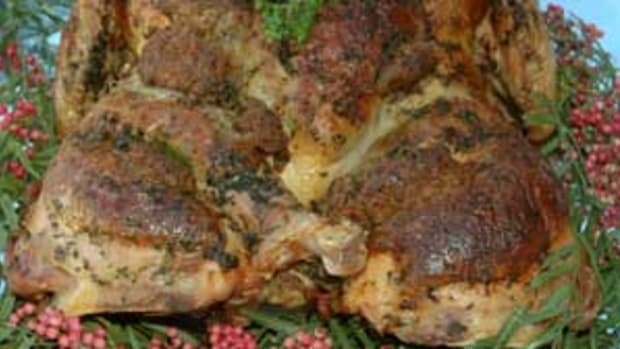 Spread remaining butter between meat and skin over thighs, drumsticks, and breast meat. Finish by spreading remaining butter over the whole bird and salt and pepper to taste. Place turkey on rack, breast side up in large heavy roasting pan. If you don&apos;t have a rack cushion bird with a bed of herb branches. Pour 2 cups stock into pan. Roast turkey for one third of cooking time breast side up (about 1 hour for a 3 pound bird). After one third of cooking time has passed, lower temperature to 350°, and flip turkey breast side down & baste turkey. Roast breast side down for the middle third, and flip breast side up for final third. Baste a couple of times during the final third of cook time. Roast until thermometer inserted into fattest part of the breast, and deep into the thigh registers 160° F about 3 hours. Remove from the oven, tent with foil and let it rest for 20-30 minutes before you carve it. The internal temperature will continue to rise 5-10 degrees. Using a wooden spoon, scrape browned bits and juices from roasting pan into large glass measuring cup or fat separator. 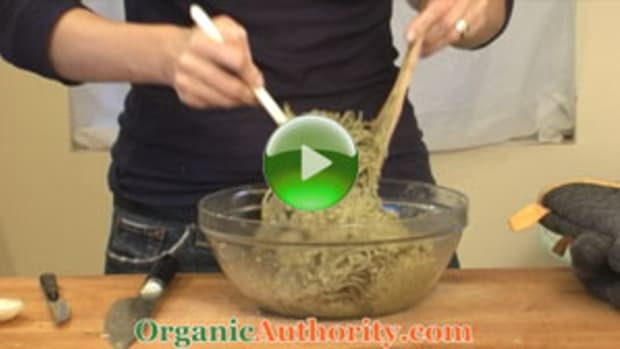 Spoon off fat and reserve 2 tablespoons. Heat roasting pan over a medium flame and add 2 tablespoons of reserved fat. Add shallots; sauté 1 minute. Reduce heat to medium-low. Whisk in 3 cups stock, wine, and degreased pan juices, bring to boil, whisking constantly. Cook to desired consistency, about 5 minutes. Whisk in rosemary and sage; season to taste with salt and pepper to taste. If desired, strain sause to remove any lumps. Check out this great list of Turkey Recipes that you will love.